The CR1800 has reached end of life. 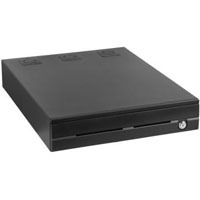 See our Heavy Duty Cash Drawers for a suitable replacement. The CR1800 was built to meet the toughest requirements of retail customers. The unit uses industrial-grade ball bearing slides for smooth and long lasting operation. The CR1800 is made with heavy-gauge sheet metal and a reinforcement beam for supporting heavy top loads. The unit incorporates a high security design with all metal construction and no external screws. Printer-driven drawer. Unless specified interface must be ordered separately. Serial RS232 Port-powered drawer. Receives power and open signal over the serial cable. USB Port-powered drawer. Receives power and open signal over the USB cable. Serial RS232 interface with programmable security code.